Meet Echo Town, a duo consisting of brothers Ric and Robert Harrison who achieve a full band sound with just two pairs of hands. Transplanted from Yorkshire to Cornwall their fanbase is divided between the two places and where ever they’ve played along route between the two locations. Instantly recognisable for their multi-instrumental performances and eclectic sound they mix the culture of the surf soaked South West with contemporary freedom songs. A live performance sees the brothers adeptly using guitar, lap-slide, stomp box, harmonica, didgeridoo and percussion with soul full singing and harmonies all full of energy. 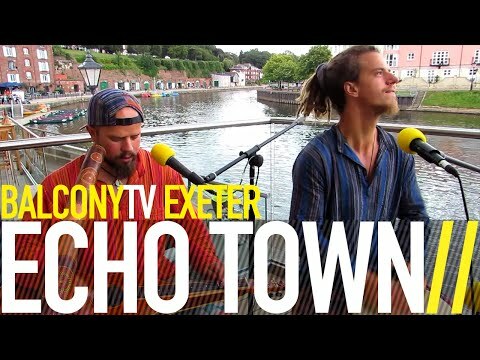 In the 3 years since the conception of Echo Town they’ve toured the UK playing festivals and venues including the support slots to Land of the Giants, Tankus the Henge and The Undercover Hippy plus filmed for the ‘Harbourside Sessions’ websites and appearing on various BBC Introducing shows. Echo Town released their second album ‘Come on Over’ in June 2011, inspired by family relationships, the great outdoors and surfing on the East English coast. ‘Come on Over’ was accompanied by music video for their single ‘Feeling Alright’ there most downloaded track to date. In summer 2014 they recorded their third album, which is set to be released summer 2015. The band will be touring tirelessly with shows at Oceanfest, Green Gathering, Looe Music Fest and the Lusty Glaze support slot for Xavier Rudd.